We are no longer accepting pre-registrations. NOTE: Due to an overwhelming response of pre-registered attendees, we recommend you contact us at forum@nigp.org to inquire whether additional registrations are being accepted. We cannot guarantee availability onsite. Cancellations must be received in writing or via email to forum@nigp.org. Cancellations received before July 15, 2018 will receive a full refund less a $175 administrative fee. There will be no refunds for cancellations received after July 15, 2018. Registrations are transferable at any time to another individual within your agency. There will be no refunds for no-shows or early departures from the event. 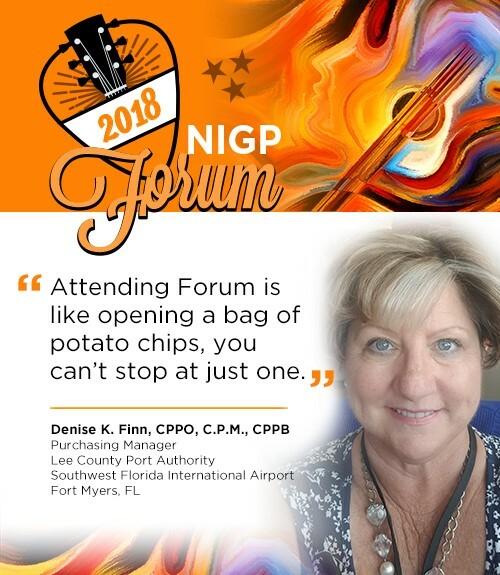 Registering for the NIGP Forum indicates acknowledgement of participating in NIGP events and activities at the attendee's own free will and intentional act. Attendees should be aware that possible physical injury could occur as a result of participation in these events. Attendees acknowledge freely and knowingly and that they are able to participate in NIGP events and hereby assume responsibility for their own well-being. Attendees also agree not to allow any other individual to participate his/her place without written notification to NIGP. NIGP plans to take photographs at the 2018 Forum and Products Exposition and reproduce them in NIGP educational, news or promotional material, whether in print, electronic or other media, including the NIGP website. By participating in the 2018 Forum, you grant NIGP the right to use your name, photograph and biography for such purposes. All postings become the property of NIGP. Postings may be displayed, distributed or used by NIGP for any purpose. NIGP is dedicated to providing a safe, friendly, welcoming, and harassment-free environment for all conference attendees and participants regardless of gender, gender identity or expression, age, sexual orientation, disability, physical appearance, body size, race, ethnicity or religion. NIGP has adopted a code of conduct which outlines expectations for all attendees and participants, including member and non-member attendees, speakers, contractors, exhibitors, sponsors, guests and volunteers. Cooperation is expected from everyone and NIGP will actively enforce this code throughout the event. * Full Conference registration fee includes access to all educational sessions, plenary sessions, products expo and all meal events. ** Conference Only registration fee includes access to all educational sessions, plenary sessions and products expo events. Meal tickets can be purchased for other meal events. *** Daily registration fee - Limited to two days. Registration fee includes all educational sessions and products expo events. Meal tickets can be purchased for other meal events. Multiple Full Conference registrations from the same chapter or agency are eligible for group discounts. All registrations must be submitted together at the same time with one form of payment. A print and fax form must be completed for each individual registering. Group registrations received with more than one form of payment will not be processed. These discounts apply to FULL CONFERENCE packages only (conference only and daily packages are not eligible). Copyright � 2018 National Institute of Governmental Purchasing. All rights reserved.